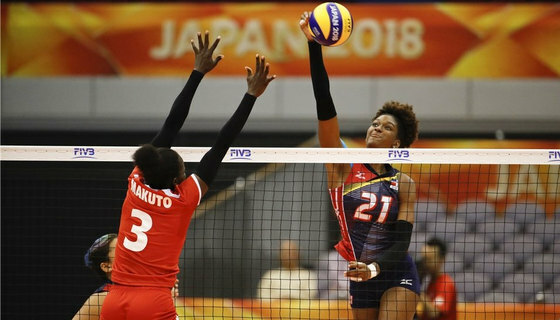 The Dominican Republic ended Kenya’s hopes of making it into the second round of the FIVB World Championship in Japan after delivering a hammering straight sets victory on Thursday. Malkia were a shadow of themselves as they lost in scores of 25-5, 25-7, 25-15. It was by far the least scoring match for Kenya who had given a good account of themselves especially against bigger opponents Brazil and Serbia. Having won only one match, Kenya and Kazakhstan who finished bottom of Group D bowed out of the competition. “We wanted to play well against the Dominican Republic. They destroyed our reception and were fast on counterattack. I wish the Dominican Republic success in the next round and hope they go all the way to the final,” Malkia head coach Japheth Munala said after the match. Yonkaira Isabel led Dominican Republic’s onslaught against Kenya collecting 16 points while Lisvel Mejia and Brayelin Martinez added 12 points each. Kenya’s poor day saw the top point pickers Leonida Kasaya and Sharon Chepchumba get only five. The Dominicans dominated in all aspects of the game on this day, exhibiting their skills on attack, serve and blocks. The Kenyan defense had trouble dealing with the power of the Dominicans and appeared listless at times. They struggled with reception throughout the match. The Dominicans jumped out to an 8-3 lead in the opening set, scoring quickly on attack and being very proficient on serve. Galia Gonzalez gave the Dominican Republic the first set 25-5 with a spike from the wing. The second set was a repeat of the first, as the Dominican Republic jumped to a 6-0 lead. Leading 9-2, the Dominican Republic went on a seven-point run to lead 16-2 at the second Technical Time Out. The Kenyans had no answer for the Dominican attack and fell farther behind. The Dominican Republic took the set 25-7 on a service ace by Martinez. The early part of the third set was competitive, as the score was 7-7 after the first 14 points, with Kenya showing energy on offense. The Dominicans went back on the offensive, scoring four straight points to go up 11-7 and led 16-11 at the second Technical Time Out.. The Dominican Republic continued to build on the lead and clinched the set and match 25-15 on a service ace by Isabel.